Substance use and related addictive disorders rate amongst the top four risk factors contributing to the global burden of disease and form an increasingly important part of medical and healthcare practice. Substance use disorders can cause, mimic, underlie or complicate a large number of common medical and psychiatric disorders. Making a correct diagnosis of the substance use disorder can facilitate clinical diagnosis, avoid unnecessary tests, shorten hospital stay and make the clinician and patient's life easier and safer. 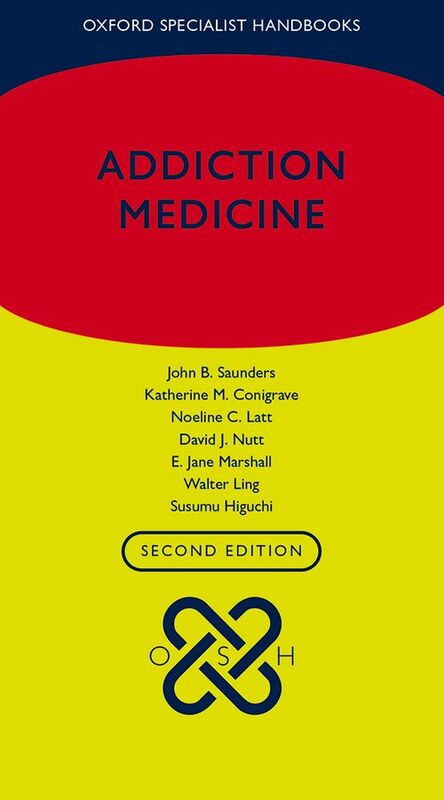 Part of the successful Oxford Specialist Handbooks series, the second edition of Addiction Medicine is a concise and practical guide for students, practitioners of medicine and other health professions who come into contact with people with substance use disorders. Providing up-to-date practical assessment, diagnosis, treatment and management options, this edition expands on the first edition through updated content and global coverage of addiction medicine. Edited by a global team of experienced psychiatrists specialized in addictions, Addiction Medicine, Second edition contains everything you need to know to assist in the assessment, diagnosis and clinical management of patients with substance use and related addictive disorders. Professor John B. Saunders is a Professor and Consultant Physician in Internal Medicine and Addiction Medicine, with appointments at the University of Queensland and University of Sydney, and with several private hospital groups. He graduated in pharmacology and then medicine from the University of Cambridge, and undertook specialist medical training in internal medicine, gastroenterology and addiction medicine. His career as a clinician, service director, researcher and academic in addictive disorders extends back over 40 years. He has been a member of many Australian government committees, including the Australian National Council on Drugs (2001-07). He has worked with the World Health Organization since 1981 and was responsible for developing the AUDIT Questionnaire. He is a member of WHO's Expert Advisory Panel on Substance Abuse and the ICD 11 Substance-Related and Addictive Disorders Workgroup. He has published four books and over 330 scientific papers, reviews and chapters. ; Professor Katherine M. Conigrave is Senior Staff Specialist in Addiction Medicine and Public Health at Royal Prince Alfred Hospital and Concord Hospital in Sydney, Australia. She has been involved for many years in training medical and other health professionals through Sydney Medical School, University of Sydney, and through training sessions for practising health professionals. Professor Conigrave's research has a focus on detection and early intervention for alcohol problems, and on improving implementation of evidence-based practice in prevention and treatment of substance use disorders. She has over 100 academic publications, has received the Senior Scientist Award for the Australasian Professional Society for Alcohol and Other Drugs, and has acted as short-term consultant to the World Health Organization on alcohol screening and brief intervention. ; Dr Noeline C. Latt is a Senior Staff Specialist in Addiction Medicine at Royal North Shore Hospital, Clinical Lecturer at the University of Sydney, and a Foundation Fellow of the Chapter of Addiction Medicine, Royal Australasian College of Physicians. She is a Physician and Addiction Medicine Specialist with extensive experience in clinical pharmacology and internal medicine at St Thomas' Hospital, the Royal Free Hospital and Royal Northern Hospitals in London and St Vincent's Hospital in Sydney. After a period as Medical Director in the Pharmaceutical Industry, she returned to clinical medicine over twenty years ago and commenced training in Addiction Medicine at Westmead Hospital and Royal Prince Alfred Hospital. As Director of the Ryde and Hornsby Drug & Alcohol Service she developed a drug and alcohol unit offering consultation liaison services and teaching programs in alcohol and substance use disorders. ; Professor David J. Nutt is Consultant Psychiatrist and the Edmund J. Safra Professor of Neuropsychopharmacology in the Division of Brain Science, Dept of Medicine, Hammersmith Hospital, Imperial College London. Here he uses a range of brain imaging techniques to explore the causes of addiction and other psychiatric disorders and to search for new treatments. He has published over 400 original research papers, a similar number of reviews and book chapters, eight government reports on drugs and 28 books, including one for the general public, Drugs: without the hot air, that won the Transmission Prize in 2014. He is currently the President of the European Brain Council and Founding Chair of DrugScience (formerly the Independent Scientific Committee on Drugs (ISCD). Previously he has been president of the British Association of Psychopharmacology. the British Neuroscience Association and the European College of Neuropsychopharmacology. ; Dr E. Jane Marshall is a Consultant Psychiatrist in Alcohol Studies at the South London and Maudsley NHS Foundation Trust and Senior Lecturer in the Addictions at the National Addiction Centre, Institute of Psychiatry, King's College London. She trained in Psychiatry at St Patrick's Hospital, Dublin, and St Bartholomew's and the Maudsley Hospitals in London. Her clinical work is currently focused on a specialist out-patient and in-patient alcohol service, and also a service for addicted healthcare professionals. She is lead clinician for the MSc program in Addiction at the Institute of Psychiatry. Research interests include the evaluation of treatment for alcohol problems in specialist and generalist settings and, in particular, treatment for addicted healthcare professionals. ; Professor Walter Ling is Professor of Psychiatry and the Founding Director of the Integrated Substance Abuse Programs (ISAP) at UCLA, one of the foremost substance abuse research groups in the US. He is board certified in neurology and psychiatry, is active in research and clinical work, and has been listed in 'Best Doctors in America'. Dr Ling's research in opiate pharmacotherapy provided pivotal information for the approval of buprenorphine and naltrexone. His current focus of research includes abuse and dependence on methamphetamine, cocaine, heroin and prescription opiates; opiate induced hyperalgesia, treatment of pain in opiate-maintained patients, including those treated with buprenorphine and the role of buprenorphine in the management of pain in these patients. Dr Ling is a fellow of the American Academy of Neurology; he has served as Commissioner for the Narcotics and Dangerous Drugs Commission, and is a consultant on narcotics for the World Health Organization. ; Professor Susumu Higuchi is Director of the National Hospital Organization Kurihama Medical and Addiction Center and Director of the World Health Organization (WHO) Collaborating Centre on Research and Training of Alcohol-Related Problems in Yokosuka, Tokyo, Japan. He has principally worked on genetics and clinical studies of alcohol use disorders, especially on the implications of genetic variations of alcohol-metabolising enzymes on pharmacokinetic and pharmacodynamic effects, organ damage and alcohol-use disorders. He has published more than 220 scientific papers in well-recognised international journals, and more than 400 papers in domestic journals. He is President of the International Society for Biomedical Research on Alcoholism (ISBRA), congress president in 2014, a director of the International Society of Addiction Medicine, and president of the Japanese Society of Alcohol-Related Problems.